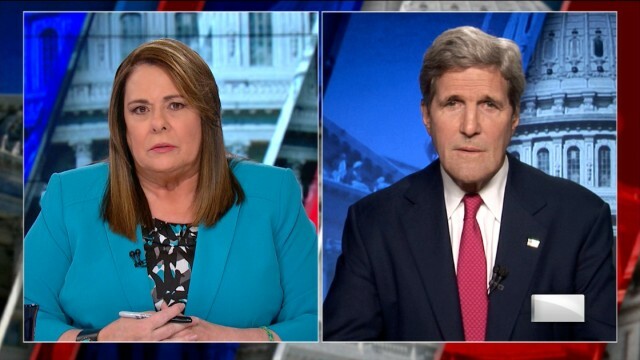 Today on CNN’s State of the Union with Candy Crowley, Secretary of State John Kerry spoke to Crowley about the downing of MH17 in Ukraine and the ongoing conflict in Israel. Full Transcript of the Interview is available after the jump. CROWLEY: Joining me now, Secretary of State John Kerry. Mr. Secretary, it’s good to see you. Let me start off with whether you know anything new about the downing of this Malaysian airliner. From intelligence information, what do we now know for certain? KERRY: Well, we know for certain a lot more, Candy. We know for certain that in the last month, there’s been a major flow of arms and weapons. There was a convoy several weeks ago, about 150 vehicles, with armed personnel carrier, multiple rocket launchers, tanks, artillery, all of which crossed over from Russia into the eastern part of Ukraine, and was turned over to the separatists. We know for certain that the separatists have a proficiency that they’ve gained by training from Russians as to how to use these sophisticated SA11 systems. We know they have the system. We know that they had this system to a certainty on Monday the 14th beforehand, because the social media was reporting it and tracking it, and on Thursday of the event, we know that within hours of this event, this particular system passed through two towns right in the vicinity of the shootdown. We know because we observed it by imagery that at the moment of the shootdown, we detected a launch from that area, and our trajectory shows that it went to the aircraft. We also know to a certainty that the social media immediately afterwards saw reports of separatists bragging about knocking down a plane, and then the so-called defense minister, self-appointed, of the People’s Republic of Donetsk, Igor Strelkov, posted a social media report that bragging about the shootdown of a transport plane, at which point when it became clear it was civilian, they pulled down that particular report. We know from intercepts voices which had been correlated intercepts that we have that those are in fact the voices of separatists talking about the shootdown of the plane. They have shot down some 12 planes, aircraft in the last month or so, two of which were major transport planes. And now we have a video showing the – a launcher moving back through a particular area there out into Russia with a missing, at least one missing missile on it. CROWLEY: At whom, Mr. Secretary, at whom? KERRY: It basically, it’s pretty clear that this is a system that was transferred from Russia in the hands of separatists. We know with confidence, with confidence, that the Ukrainians did not have such a system anywhere near the vicinity at that point in time, so it obviously points a very clear finger at the separatists, and that’s why President Obama and the international community are demanding a full-fledged investigation, which Russia said they would do. CROWLEY: Do you believe them, Mr. Secretary? Because honestly, ever since Ukraine came into the news, the Russian takeover of the Crimea et cetera, et cetera, it seems to me that President Putin and your counterpart in the foreign ministry has said one thing and done entirely different things. CROWLEY: They said they’d help, you know, do peace, they haven’t done that. Now you’re saying look, they basically gave equipment to the separatists that they had to train the separatists on, a very sophisticated piece of equipment that then downed a commercial airliner, so there’s really no doubt that at the end of this trail, is there, is Moscow. So why do you even trust what they’re saying? KERRY: There’s no doubt, nobody’s trusting. There is no question of trust with, you know, that would be ridiculous at this point in time to be trusting. What I’m saying is that this is the moment of truth for Russia and for Mr. Putin, where they need to stop just saying things, and they need to make sure that they happen. And that is why, precisely why, what you just said, the fact that they’ve been talking and nothing has happened is exactly why only the day before this incident, President Obama put in place tough additional sanctions on banking, on energy, on defense firms, on specific companies as well as additional specific individuals, and we hope that this will be a wakeup call for some countries in Europe that have wanted to sort of stand back and give this more time and worry more about the trade relationship. CROWLEY: Mr. Secretary, do you believe that Russia is culpable for the downing of this commercial jetliner? If they gave these separatists the equipment, whether or not they were there on site, at the moment the anti-aircraft missile was launched, we do know, from folks that have said so publicly in the intelligence community, that in fact they had to have been trained by Russians, they had to have gotten the equipment from Russia. Doesn’t this make Vladimir Putin culpable for this plane crash? KERRY: You know, culpability is a judicial term, and people can make their own judgments about what they read here. That’s why we’ve asked for a full-fledged investigation. Yesterday, on Friday, the investigators and the people who were needing access, the OSCE monitors, were given 75 minutes. And obviously, the area is under the control of the separatists. Yesterday, they were given 3 hours. Today, we have reports of drunken separatists piling the remains of people into trucks in an unceremonious fashion, actually removing them from the location. They are interfering with the evidence in the location. They have removed, we understand, some airplane parts. It is critical. This is a very, very critical moment for Russia to step up publicly and join in the effort in order to make sure there is a full-fledged investigation, that the investigators and people who were coming to help from outside, the ICAO, the FBI, the National Transportation Safety Board, we’re sending people over; others are sending people, experts, who have an ability to be able to put these facts together so no one will have doubt, no fingers will be pointed about conspiracies, about ideology and politics governing this. We want the facts. And the fact that the separatists are controlling this in a way that is preventing people from getting there, even as the site is tampered with, makes its own statement about culpability and responsibility. KERRY: Well, yesterday, yesterday, Candy, I had a direct conversation with my counterpart, Foreign Minister Lavrov. It was a direct and tough conversation. We’ll see if anything happens as a result of that. I’m confident that President Obama will shortly be talking yet again to President Putin, in order to find a way with very specific steps to move forward. But President Obama, I remind you again, the day before this event, unilaterally moved, even before this, to put tougher sanctions in place, what we call sector sanctions, sanctions that begin to do something about their energy companies, about their defense companies, about their banks. Several of their biggest banks will now not be able to access the market. CROWLEY: But Mr. Secretary, do you think, but do you think, but so far, these sanctions have not changed Russia’s behavior in the least. KERRY: That’s why they were ratcheted up. That’s precisely the point. I don’t think anybody in America is yet talking about putting troops in there. Nobody’s talking about military. The point is that we’re trying to do this in a thoughtful way, with a maximum amount of diplomatic energy and pressure, and it would help enormously if some countries in Europe that had been a little reluctant to move would now recognize this wakeup call and joint the United States and President Obama in taking the lead and also stepping up. That’s important. CROWLEY: And if Russia does not — continues to not try to get some control over these pro-Russian separatists, if it, you know, says, oh, we want a free and open investigation but doesn’t do anything about it, it says that it wants to help get a cease-fire going and it doesn’t, then what? KERRY: Well, those are precisely – we are in conversations with the government of Ukraine. We’re in conversations with our European allies and we’re in conversations internally. As I said, the president just took very important tough measures the day before this happened. So those are going to sink in, and they have to sink in, and I think coupled with the international outrage over the treatment of this site and the treatment of the remains and the disrespect for the 189 or so families, or 98 families, this is unacceptable by any human standard, by any civilized standard, by any 21st century standard, and I hope Russia will step up and take steps that the world can measure, not words, actions. CROWLEY: And Mr. Secretary, I have to let you go, but I can’t without asking you about Israel, which has now expanded, it says, its attack into Gaza to try to stop the missiles from coming into Israel. We all know that the U.S. believes in Israel’s right to defend itself. Are there in your mind any line after which you think Israel has gone too far? Have those discussions taken place at all? KERRY: Well, the president talked to Prime Minister Netanyahu Friday. I talked to Prime Minister Netanyahu yesterday. The president is talking to him again today. We’re in constant conversations, and I believe the president is asking me to go over there in very short order to work on the issue of the cease-fire. I was in touch yesterday with Secretary-General Ban Ki-Moon. We’ve agreed to meet at a certain time, we’re working on the idea of a cease-fire. Israel is under siege by a terrorist organization that has seen fit to dig tunnels and come through those tunnels with handcuffs and tranquilizer drugs, prepared to try to capture Israeli citizens and take them back to hold them hostage. No country could sit by and not take steps to try to deal with people who are sending thousands of rockets your way, literally in the middle of a conversation both with the president and with me. While we were talking to the prime minister, sirens went off, the prime minister of Israel had to interrupt a conversation with the president of the United States, to go to a shelter. People can’t live that way. And Hamas needs to understands. We are supporting the Egyptian initiative for a cease-fire. We will work for a fair cease-fire, and we will work afterwards, as we have shown our willingness to try to deal with the underlying issues. But they must step up and show a level of reasonableness, and they need to accept the offer of a cease-fire, and then we will certainly discuss all of the issues relevant to the underlying crisis. No country has indicated a greater willingness to do that, and no president has been more willing to put himself on the line in recent time to do that than President Obama. CROWLEY: So as I understand it, what you were saying is that the U.S. is comfortable with the Israeli actions thus far, but you would like to see a cease-fire. KERRY: Candy, Candy, please, no country, no human being is comfortable with children being killed, with people being killed. But we’re not comfortable with Israeli soldiers being killed either, or with people being rocketed in Israel. So you know, in war, it’s very difficult. There tends not to be a sort of equilibrium in terms of these things. The fact is that we’ve asked Israel, and Israel has said we will try to reduce whatever we can with respect to civilian involvement, and civilians have been warned to move well ahead of time. The fact is that Hamas uses civilians as shields, and they fire from a home and draw the fire into the home, precisely to elicit the kind of question you just asked. We need to have a cease-fire, and then we need to have a reasonableness to once and for all address the underlying issues so that hopefully, people could find a peace and a way to live that is different from the way Gaza has had to live and Israel has had to live and the West Bank has had to live for far too many years. But it’s important for people to demand appropriate behavior by all the parties, and Hamas has engaged, Hamas, you know, began rocketing, Hamas began rocketing in response to Israel’s legitimate efforts to try to find people who killed and kidnapped three young Israeli boys, and people need to keep, you know, the focus on the factual trend here of what happens when and what leads to what. Yes, we want the fighting to stop, and we want to see a cease-fire, but it’s got to be a cease-fire without a lot of rewards for terrorist behavior, without any rewards for terrorist behavior, has to be a cease-fire without conditions, and then we can sit down, and the United States will fully guarantee to all parties that we’re prepared to talk about all the issues.